I’ll get day five underway with The Beloved. However it’s not The Beloved you may have been expecting. I played The Sun Rising to death at the time, but for me ‘It’s Alright’ is far more summery and reminds me of early 90s holidays. This is the single version and the video works well – standing on the tube whilst dreaming of hot air balloons. 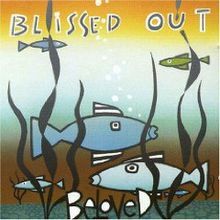 However do also check out the extended version on Blissed Out, one of the best remixes ever in my humble opinion. They don’t make lyrics any more summery than that. 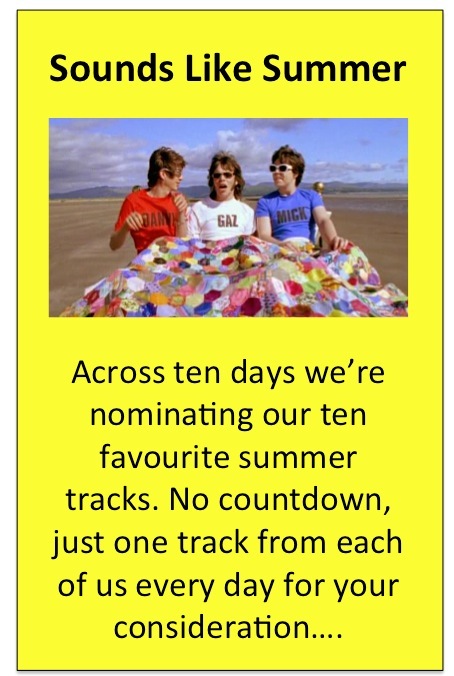 Scroll down to see entries to today’s playlist from Roy, Andy, Sindy & Gerard. You could have pretty much picked anything from ‘Blissed Out’ – complete laid back (Blissed Out even) vibe all the way through. I was going to throw ‘Sun Rising’ into the mix at some point but this will more than suffice as the Beloved’s contribution. Our first instrumental, I think. Isn’t there a version of this with a voice saying ‘Huhrrrhhhh! Wipeout!’ periodically or am I conflating it with another track? The vocal intro is only at the beginning – there are loads of versions of this but this is the original (and best) ! ok I’ll post this now so you can spend the rest of the day making fun of me. In the days before Cougars and Ashley Madison websites probably. This works surprisingly well as a companion piece to my choice for Monday, but more than that I cannot say. The little keyboard riff ‘da – da-da- dahhh’ I remember well and surely should be sampled on some Belgian EDM track – assuming it hasn’t already. I had to google who Ashley Maddison was, so this process is also proving very educational. Sorry Sindy – can’t get beyond the haircut and polyester suit. Fortunately salvation was at hand in the shape of the first Ramones album, released in the same year. Shut your eyes though and it’s actually a pretty good tune. That is the curse of youtube. Same will apply to my next pick. Now debating whether just to post the lyric video instead. Anyway I have till Sunday to decide. I know you’re going to post Terry Jacks ‘Seasons in The Sun’ on Monday – I’m ready for it ! further to the aforementioned apt comments .. It is a cracking tune and may I add … at least he can boast a hairstyle .. well, of sorts. Gotta love the matching coloured suit and guitar too. I’d forgotten what he looked like … shan’t forget now though! Indeed, this is the first day since we started this playlist that the weather has been – to quote Roy’s choice, come to think of it – a Wipeout. Very gradually I have been reaching the conclusion that Elbow may well be the band of the millennium so far. Should have gone for U2’s ‘Summer Rain’ today ! Band of the millennium so far ? Arcade Fire, surely ? Hmmm good point. Will have to go away and have a think about that one.